A former Rainhill High School pupil has a bright future ahead of him having come top of his class at law school. 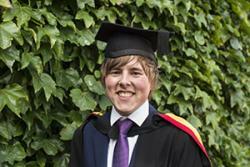 Not only did Adam Gulliver, from Whiston in Knowsley, come top of his year at Bangor University’s Law School, but he was also nominated for the University’s Dr John Robert Jones prize for achieving some of the highest marks of all 2,187 graduating students. Now, 21-year-old Adam is set for an illustrious career, having already forged a name for himself in the legal world. Throughout his time at Bangor, Adam has been an avid participant of mooting, an extracurricular activity which sees law students argue a fictitious case in simulated court proceedings. In 2013, he and fellow LLB Law student Aaron Clegg established the Legal Advocacy Society, with the aim of providing more mooting opportunities to their fellow students, alongside specialist skills sessions to help those students hone key skills. He and Aaron also became the first Bangor Law School team ever to win the Welsh National Mooting Competition, beating off stiff competition from all over Wales before trouncing Aberystwyth University in the final earlier this year. Adam also made history in 2013 as a member of the first team ever to represent Wales at the internationally-renowned Telders International Law Moot Court competition, where they reached the semi-final rounds. He returned to the Telders contest in 2014 as student coach to the Bangor team. Adam’s success in the mooting world is all the more remarkable given that before coming to Bangor, he had never even heard of it. “I remember that I was initially apprehensive about getting involved with it and did not think it was really for me”, he says. “Had it not been for compulsory moots in the first year, I doubt I would ever have got involved with mooting, meaning that I would have missed out on some unforgettable experiences. “It has basically been my life for the last two years”, he adds. Those skills will be put to further use later this year, when he represents former Bangor Law graduate Alex Gibson at the Court of Appeal in relation to an ongoing dispute with her previous employer. Although Adam is unable to release many details at this stage, he confirms that the pair are currently working together on the appeal. It was this commitment to welfare that first attracted Adam to Bangor, at a time when he was overwhelmed by the sheer number of universities he had to consider. “What made Bangor stand out from the rest was the personal approach of the School”, he recalls. “By choice, it's a relatively small law school, but this means that you get to know everyone, students and staff alike.